Most people choose to sign in a one-time promo that caters all of your communication needs. 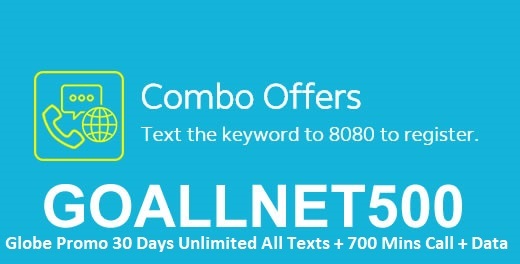 With Globe GOALLNET500, you can have a combo bundle with combination of call, text and data for 30 days. You may contact your pals and love ones without doing a daily registration giving you less trouble way of connecting with them from day to day.All you want is to bear in mind the keyword then save it to your inbox on your next subscription reference. 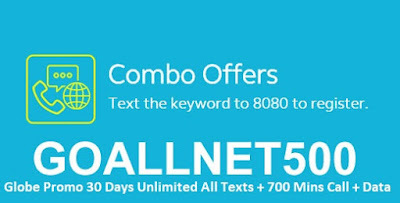 With Globe GOALLNET500, you can enjoy unlimited texts to all networks, calls to Globe/TM/Cherry Prepaid and ABS CBN Mobile, all-net calls and limited data for mobile browsing. All of that best cost you 500 pesos for 1 months meaning you only spend round php17.00 day by day for this combination promo.You can do this without difficulty check in to this globe provide. All you want to do load your pay as you go account with the quantity of php500.00. You may reload through on-line, load store, kiosks and other reseller shops nearest you. Use the keyword or code format beneath to subscribe with this GoALLNET promo. Just text GOALLNET500 send to 8080. How to Subscribe GOALLNET500 via *143# Globe GoSAKTO USSD menu? Select option 2 or GOALLNET. Select option 1 to subscribe. To check the status, expiry data and remaining balance just text GOALLNET500 STATUS send to 8080. To stop this promo, you can also text GOALLNET500 STOP then send to 8080.